Saffron Tree: Happy 110th, Dr. Seuss! 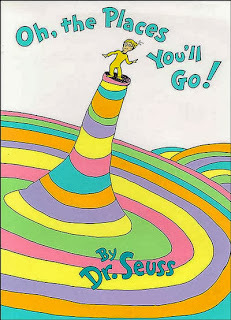 We at Saffron Tree love Dr.Seuss, and therefore never miss a chance to celebrate him. Here's to his 110th! This post is from guest reviewer, Bubble Ink : A not-so-avid reader turned into a children's book enthusiast who in her day job works in the IT sector, in her night job, dreams and in the time between reads to her 2 year old. Reading aloud to children is magic unfolding; for some, it is transportation to a different fantasy world, while for some, it is therapy. All in all, it is joy, and this joy gets better when you get to pass on to your little ones, something that you yourself read and enjoyed as a child. Dr Seuss books are one such. We want to do our bit by passing on your books to the next generation by reading them aloud to our children. There is great inspiration in books like Oh! The place you'll go. A lovely read. 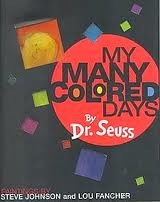 His debut board book My Many Colored Days, is sheer genius. With watercolor illustrations and rhyming sentences, he speaks to the many moods of toddlers, while introducing colors. It is no ordinary board book. "A person's a person no matter how small" There is something for every toddler in his books, take him/her to Suessville and there is no looking back. Giggling, cuddling, prancing, teaching, practising reading and inspiring - you can do it all with Dr Seuss and your toddler. He himself rightly said, "Adults are just outdated children". Reading Dr Seuss is sure to take you on a nostalgic trip if you had read him as a child or if you didn't, you are sure to enjoy it even now. One never outgrows a Dr.Seuss book. The illustrations bring a smile to you, the witty stories remind you to revel in silliness, the rhymes enchant you and his quotes touch your hearts. I was beating myself up over the fact that this day went by without me posting anything on ST - poor planning, and no time yesterday. It was a pleasant surprise to see this post! 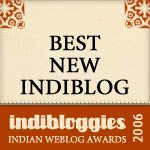 Thanks, Bubbleinkwrites, for this post. Oh, and yes, Happy 110th, Dr Seuss! Thanks Sandhya! It was my pleasure to write it!